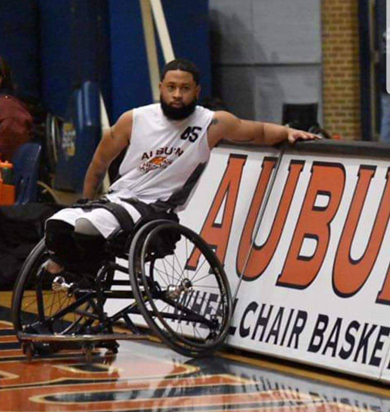 Woody Thornton is a player and coach on the Auburn D3 wheelchair basketball team. He and Tallassee's Montrerius "Boonchie" Hucherson are teammates who will be traveling to Chicago next month for the D3 championships. Another player, Bryan Foley, is engaged to Melissa Phillips of Tallassee. Thornton has Tallassee ties himself. His mother and father, Henry and Gloria Thornton, are from Tallassee. "Mom was a Coker," Thornton said. "We're related to Matt Coker, the principal. Clay Brantley is my cousin." As for the connection to Hucherson, Thornton reached out to him last year. "Boonchie is a great story," he said. "I had a couple of people tell me, 'There is this guy who has had a motorcycle accident. We want you to meet him.' That was June when I heard about it. His accident was in May of last year. We have a support group that meets at Lake Martin. He came to it in September. "When he heard that we were playing wheelchair basketball, he's like 'I want to come.' He has developed as quick as anybody I've ever seen. He played ball for Tallassee. He just got a new chair. It's been a lot of fun having him on the team." 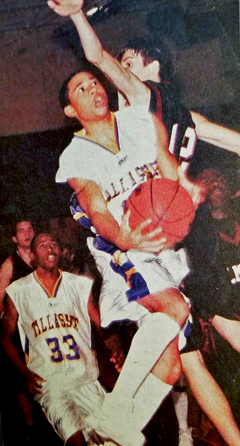 Hucherson, now 28, played basketball during the Coach Shane Smith years at Tallassee. He graduated in 2008. "I was no stranger to basketball," Hucherson said. "My life really changed being a double amputee below the knee. Also, they amputated nine of my fingers - half of each. The positive thing about it is I'm still alive and have a purpose. I just embraced the new me and I'm going to make the best of it." "Back when I was in college at Auburn in 1989, I had too much to drink one night," Thornton recalled. "I wound up trying to walk home on the railroad tracks and tripped, fell down and passed out. I got run over by a train. I lost both feet, had a broken arm and broken jaw. "But, God's been good to me. He's brought me through all these opportunities. I met my wife. We've got six kids now, two grandkids - all after the accident." Thornton started the Christian based Cast Ministries for amputees. "We run Cast Ministries. When wheelchair basketball started up, I started playing it. They used to be separate. 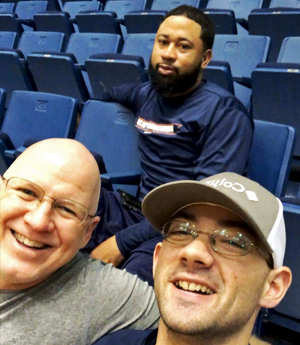 When the university went intercollegiate, it gave me the opportunity to run the wheelchair basketball under the Cast Ministries." Thornton never played organized basketball before but now has nine years with the Auburn D3 team. 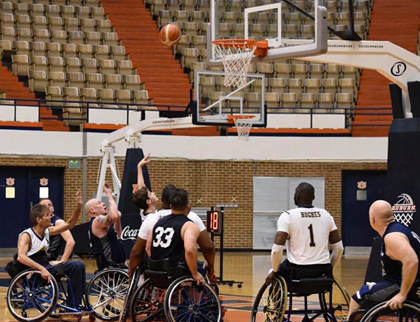 "About the only difference between wheelchair basketball and standup ball rules are there is no double dribble and for traveling you get two pushes on your wheels and you have to dribble." In addition to basketball, Cast Ministries also offers other sporting activities like 5K "Run, Walk and Roll" and water skiing called ampuski. "The Montgomery Ski Club was a show ski team. The guys were like, 'Why don't you do a pyramid with us?' So, it was me and another guy on bottom. We had a girl climb up on our shoulders." Not much has held Thornton back. "You just have to learn to do it differently," he said. Hucherson still sees the brighter side of life too. "I thank God for sparing my life," he said. "This whole road to recovery hasn't been easy since my accident on May 20, 2018, but I kept a positive outlook on life and faith not just for me but for my two-year-old son. When he looks back he will be like my dad was a really strong person. You never know how strong you are until that's all you have to be. "I got back into my roots with basketball but only in a wheelchair. I had to do something to keep me busy and my mind off of things. (It's) very challenging. There is a lot you have to learn. It's kind of special to be a part of it. It's our first time ever making nationals, so we're going try to make the best of it." The No. 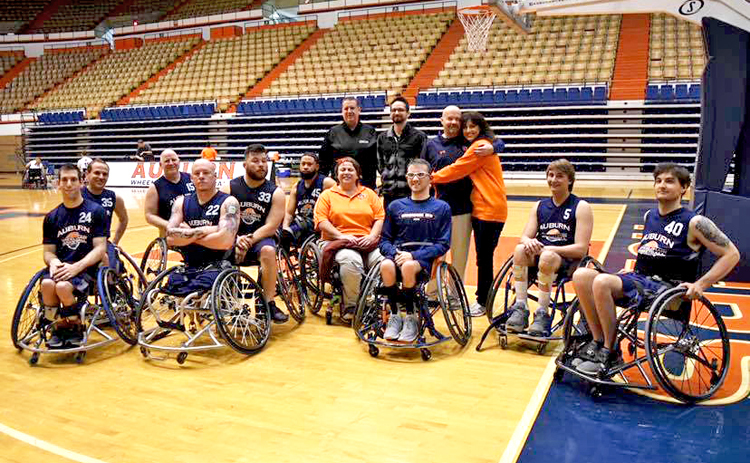 9 Auburn D3 wheelchair basketball team will make the trek to Chicago for the National Wheelchair Basketball Association National Championship, April 5-7.